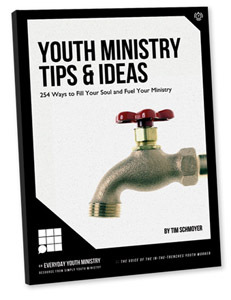 In 2007 I released a little ebook I wrote titled, “130 Youth Ministry Tips & Ideas.” Since then it’s received well over 300,000 downloads and continues to grow and circulate all on its own. When it reached the quarter million mark I thought to myself, “Hmm… I should probably do that again sometime.” And so I did, except this time Group Publishing/Simply Youth Ministry teamed up with me and published it as a part of their brand new line of digital and print-on-demand books called, “Everyday Youth Ministry,” which is a series I’m honestly very excited about. Definitely check it out! This new ebook is a continuation of my first ebook and contains “254 Ways to Fill Your Soul and Fuel Your Ministry.” Much of it is based on content that’s been published here at Life In Student Ministry, but a lot of it is also brand new content I’ve never shared anywhere else. Part of the success of the first ebook was that I made it completely free and took a very hands-off approach to how people used it, distributed it, read it, etc. Simply Youth Ministry agreed to take that same approach with this ebook and is doing the same thing — making it completely free for you with no strings attached. Soon we’ll have the book available in the different app stores to make it easier for people to download to their devices, but in the meantime you can download the source files and either load them straight to your e-reader or read the PDF on your computer.